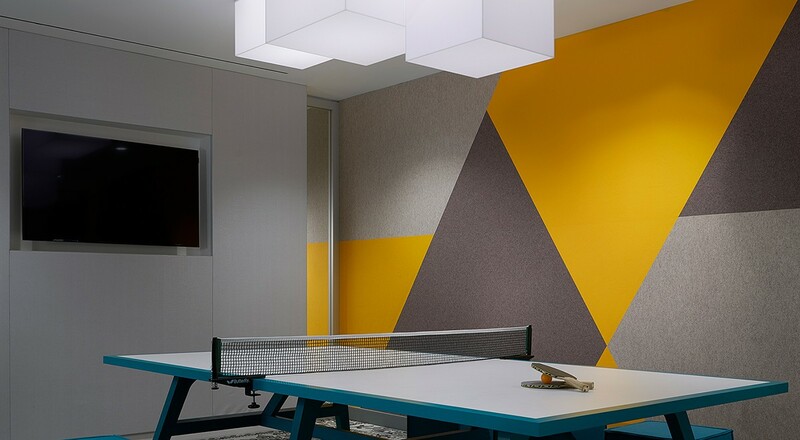 At a confidential financial information and analytics corporation, 100% Wool Design Felt is installed throughout the space to provide textural custom wallcovering plus screening and acoustic treatments. 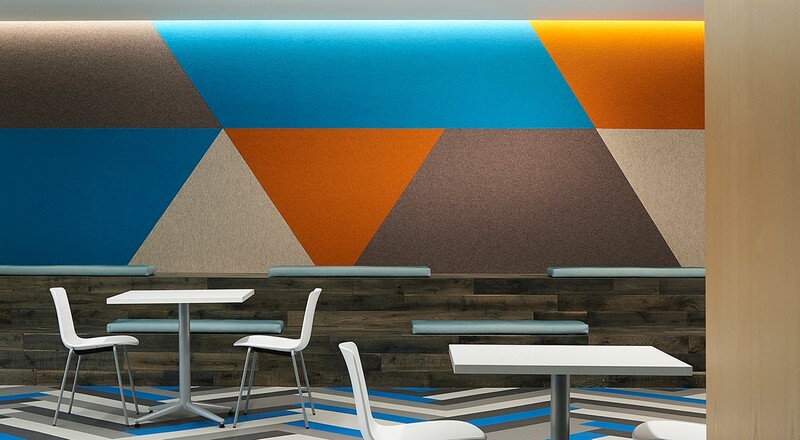 In a Break Room, angular sections of four felt colors including a bright blue (686 Enzian) and orange (116 Orange) come together to create a feature wall that’s hard to miss. Elsewhere, the same greys are paired with a vibrant yellow (124 Gelb) to create another one-of-a-kind wallcovering. Staying with the saturated color palette, ARO Array 3 Hanging Panels in a rich blue-green (312 Lagune) hang on two-channel Hanging Panel Track System to provide privacy plus soften sound in the glassy conference room. For more information on the products featured, please visit 3mm Wool Design Felt, ARO Array 3 Hanging Panel, and Hanging Panel Track System. FilzFelt may also CNC cut Wool Design Felt in just about any size or shape. Visit CNC cut Wool Design Felt for all the details.